The Mystery Behind The Lewis Chessmen: A Possible Icelandic Origin? According to a recent research on some walrus bones found in Iceland, the precious and reputed Lewis Chessmen that are on display at the British Museum in London and at the National Museum of Scotland in Edinburgh might actually be Icelandic in origin. The Lewis Chessmen represent one of the fewest best preserved chess sets in medieval history and were mostly made of walrus ivory (with few exceptions made of whale teeth). Originally, they were discovered in 1831 in the Outer Hebrides (specifically on the Isle of Lewis), north-west of Scotland, and were most likely made sometime during the 12th century. The set consisted of 93 artefacts when it was found in the Hebrides, namely 78 chess pieces, 14 tablemen and one belt buckle. Nowadays, 82 pieces are on display at the British Museum in London, while the remaining 11 are owned by the National Museum of Scotland located in Edinburgh. The set’s pieces consist of 8 kings, 8 queens, 16 bishops, 15 knights, 12 rooks and 19 pawns. The heights of the pawns range from 3.5 to 5.8 cm, while the other pieces’ heights are comprised between 7 and 10.2 cm. Throughout the time’s passing there have been quite a number of speculations regarding the origin of the Lewis Chessmen. 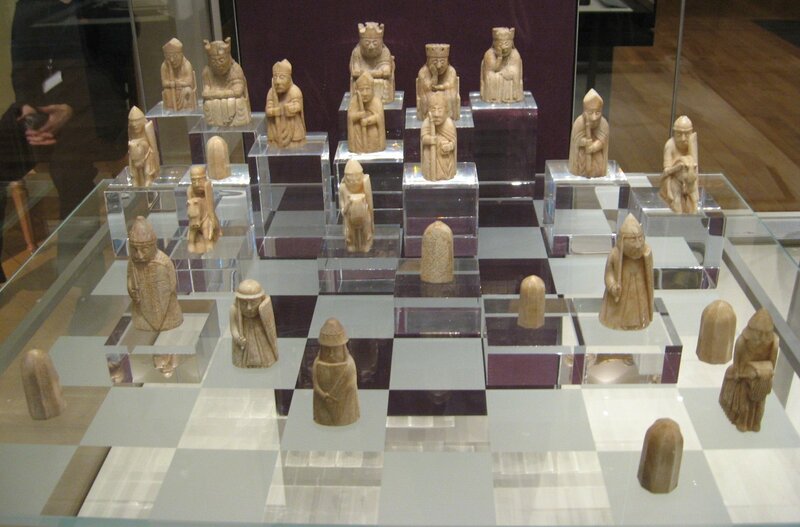 Initially, it was thought that the chessmen were made in Trondheim, Norway during the 12th century, but subsequently other Nordic countries have been suggested as the place of origin for the medieval chess board. At the time, the Hebrides pertained to the Kingdom of Norway, which is why the initial hypothesis regarding its origin is likely to be true. However, the Icelanders Gudmundur Thorarinsson and Einar Einarsson proposed the fact that the chess set is actually Icelandic in origin, since only there during the Middle Ages were bishops referred to as such, while in other Germanic languages they were given names completely unassociated with the church (i.e. ‘runners’ or ‘messengers’). This theory might be supported by a carbon dating of several walrus bones found in the Snæfellsnes peninsula, in northwestern Iceland which indicate that the respective bones are 2,000 years old. The walrus ivory was an important good that was used in the trade during the Viking Age and the walrus bones that might have originated in Iceland could have presumably ended up in the Hebrides through a shipwreck. A kite-shape shield that was excavated in Trondheim is quite similar to the shields on some of the chess pieces. Additionally, a king piece of similar design that was found on the Hitra Island, near the mouth of Trondheim Fjord, bears resemblance to the some shields on some figures. Dr. Alex Woolf stated that the armour worn by the chess figures includes ‘perfect’ reproductions of the armours worn in Norway throughout the 12th century. There is yet another alternative theory which proposes the fact that the figures might have been either hidden or lost during a Viking voyage from Norway to the Norse settlements in Ireland (most notably to the towns located on the eastern coast of Ireland, including Dublin). In the end, without further evidences, the Lewis Chessmen are likely to remain yet another unresolved enigma of the Middle Ages, hotly disputed in regards of its origins.